Aquaculture is the controlled growth of aquatic source protein for human consumption, study or ornament. Most of us are interested in just the last two. We are, indeed, all aquaculturists; some more scientific than others. As a person who has made their living for decades by spanning between the often times entirely seperate realms of science, business and hobby aspects of aquatics, I assure you that you possess tremendously important, possibly unique information of economic importance to aquaculture. Mariculturists and fresh-water growers of fishes, invertebrates and algae would do well to associate with aquariculturists. Several species of marines, pet, food, and just scientific, have been bred and raised in captivity. Techniques employed range from environmental and hormonal manipulation, to "just plain luck". The present situation finds only a few species of fishes (clowns, cleaner gobies) and algae raised in commercial numbers with many "pilot" programs investigating the culture of invertebrates (corals, crustaceans and more). There has been a long-standing economic and quality bias against aquacultured specimens. With improving technologies, legal regulation and economies of scale the future looks bright for captive propagation and grow out. The following is a brief overview of the opportunities, challenges and underlying principles of aquaculture. With diminishing wild stocks, the ability to manipulate genotypes, and degradation of "wild" habitat, there is a growing need to supplement "natural" species with cultured. Estimates vary, but total aquatic protein consumed by humans is about one hundred million metric tons annually, of which only a couple of percent is "cultured". There are measures of optimum and sustainable yield that guestimate that we are nearing reasonable harvest limits of desirable species. Aquaculture can, should, will be further employed to augment world nutrition. Practiced for at least four thousand years. As aquarists we can pick out tilapiine and haplochromine cichlid fishes in the glyphs of Egypt. Large minnows/carps of several species have been bred and reared for food in India and China for three plus millennia, as have anabantoids in Java (how bout a nice pickled gourami?). I've already mentioned the state of natural stocks. The ornamental fish trade has also been negatively impacted. A few "happy stories" can be pointed to, for instance Hawaii and Guam, where the pet-fish trade is adequately protected/regulated. Many places in the Philippines have been virtually fished-out, with desirable species being collected further and further away. Underdeveloped, third-world, less-developed, "poor" countries: can benefit by improving diets with economic "high-quality" protein. Please permit a small digression here> Proteins are composed of smaller units, amino acids. There are only twenty one of these naturally occurring. You and I and all fish studied have to ingest ten of these (we can make the others). Three, tryptophan, lyseine and threonine are mainly derived from animal sources. Due to food web transfer inefficiencies, these are "expensive" and frequently in short supply in "poor" people's diets... Thanks. Luxury cultured items like shrimp, lobsters, salmon, yellowtail, blue-fin tuna and others are money-makers providing food and recreation for the fortunate few. 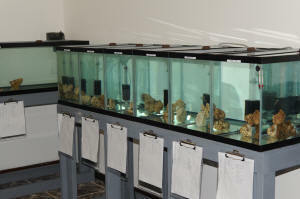 Every type of reproduction is presented in the organisms kept by marine aquarists. The fishes manifest all variations of sexual propagation, laying or broadcasting eggs and sperm, bearing live young, utilizing internal fertilization; with some, none, or limited parental care. Invertebrates run the entire gamut, sexual and asexual, through splitting into even or uneven parts. Hobbyist and commercial breeding and rearing of marine livestock requires an understanding of the life history of the species, nutrition and development. A particular impediment to raising young to saleable size has been the lack of useful knowledge on nutrition. Many species have been "bred" or non-intentionally spawned in captivity. The coming years of environmental regulation and comparative costs should see the furthering of captive breeding and rearing programs over wild collection. Hoff, Frank. 1985. Who and what was instant ocean hatcheries? FAMA 8/85. Kloth, Thomas C. 1979. Breeding and raising tropical marine fish. parts 1-3. FAMA 4-6/79. Michael, Scott W. 1995. Fishes for the marine aquarium; looking at reproduction schemes. AFM 3/95. Siddall, Scott E. 1979. The culture of marine fish larvae, parts 1,2. FAMA 10,11/79. Spies, Gunter. 1985. Marine aquatics; what marine fishes can be bred? Today's Aquarium- Aquarium Heute 3/85. Thresher, R.E. 1984. Reproduction in Reef Fishes. TFH Publications, Inc, Neptune City, NJ. Tullock, John. 1988. Tank raised marines; what and how soon? Marine Fish Monthly 3(11):88. Tullock, John. 1989. Tank raised marines; impossible for the hobbyist? Marine Fish Monthly 1/89. Watson, Craig A. 1995. Investing in the future: captive breeding of marine tropicals. FAMA 3/95.